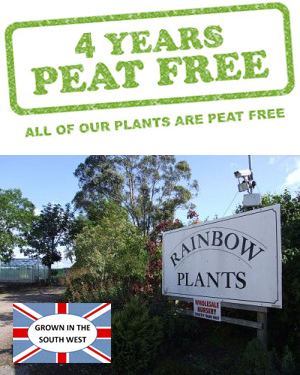 Want the latest Rainbow Plants news and updates? Sign up to our newsletter today to keep up to date. Here at Rainbow Plants we’re a wholesale supplier of hardy nursery stock to garden centres and landscape contractors across the South West, including Devon, Cornwall, Dorset and Somerset. We not only offer wholesale plants for sale, but you will always receive a warm welcome from us. Established for over twenty years on its site in East Devon, our plant nursery is situated on the outskirts of Ottery St Mary, only 15 minutes from the M5 and 5 minutes from the A30 trunk road. Originally developed and run by Bob & Pam Joy, the nursery is now in the ownership of Peter & Diane Rider. The nursery is known for the delivery of quality plants and good service which remains our ethos. Rainbow Plants is a wholesale supplier to garden centres and commercial landscapers. We are happy to offer a cash & carry service to visitors. We are open from Monday to Friday 8.00 am to 5.00 pm but can be available at other times by appointment. Our plants are produced from British sourced liners with larger specimens available from specialist growers across the UK and Europe. We use a minimum of pesticides, relying heavily on natural biological control for pests and have regular inspections from DEFRA to ensure plant health is maintained for the customer. Check out the video below for a quick tour of our Devon nursery.